Trailhead is at the end of South Pond Road in Stark, NH. South Pond Road starts on Rt. 110, 10.2 miles east of Rt. 3 in and 3.6 miles west of Rt. 110A. Drive 0.4 miles down the road, then turn right to stay on it. In another 0.4 miles, turn right to stay on the road again. This part of the road is gated in the off-season. If it is closed, park here and walk just over a mile down the road. If it is open, drive down the road and park in the parking area. The Kilkenny Ridge Trail begins near the shore of the pond, to the right of the beach. Devil's Hopyard is one of the most bizarre places in the White Mountains. It is a long ravine filled with moss covered boulders and hemlock trees. The trail begins at South Pond Recreation area and follows South Pond in the beginning. Soon it leaves the pond and leads through pleasant woods. Just after crossing Devil's Hopyard Stream (0.6 miles into the walk), Turn right onto Devil's Hopyard Trail. After recrossing the stream, the environment changes completely. 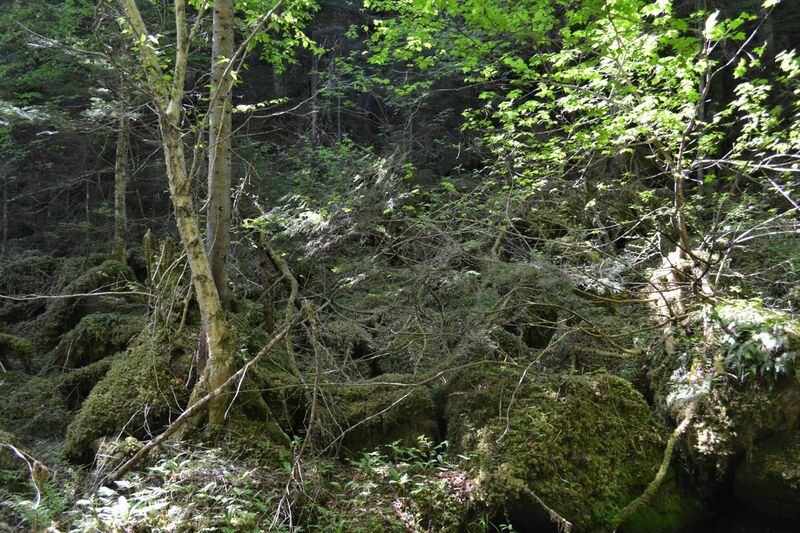 You'll start to see some rocks and moss, as well as some dead hemlock trees, and very quickly it turns into a green, boulder-filled ravine that doesn't look anything like the forest around it. The stream runs through the ravine, but it is buried beneath the moss and rocks. Look for wildflowers growing on the moss. Venture as far in as you'd like; the trail ends 0.6 miles from Kilkenny Ridge Trail.